of oil field and industrial applications such as Electric Submersible Pumps (ESPs), Horizontal Pumping Systems (HPS), Progressive Cavity Pumps (PCP) and Non-Optimized Recipcrotating Pump Systems (RPC). There are two versions of the CUBE VFD Motor Controller, the first has fully independent AIO & DIO built in and the second the CUBE HMI uses the inputs & output of the VFD system, both systems are otherwise functionally identical. The CUBE VFD provides real-time monitoring and logging of electrical parameters (current, voltage, frequency, power, DC bus voltage) and intelligent control of VFDs based on advanced logics. 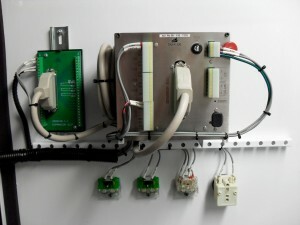 It integrates the Down Hole Tool (DHT) monitoring, Backspin & Ground Fault (BS&GF) protection, and multiple Analog and Digital inputs/outputs for Alarms and shutdown functionality with continuous trending capability. Alarms and trip set points have flexible time and restart options. This allows the User to program The CUBE VFD for protection of various configurations and field conditions. In addition to monitoring and logging the electrical parameters of the protected VFD (& motor), The CUBE VFD also allows the User to program Alarms and set points for external sensors monitored through the Analog and Digital inputs. The communication features of The CUBE VFD includes: (1) front & rear USB ports, (2) a rear LAN port, (3) RS485 master & slave ports (Modbus® RTU compatible), (4) on-board 4×20 character transflective display screen with LED lights, and (5) intuitive full data entry keyboard for fast and accurate entry of data and programming set points. The USB ports are multifunctional and can be used for downloading Logs and Trending files to a standard USB pen drive, for firmware updates, and for communication with external modules. Standard TCP/IP protocols are used for communication with PC devices.